Hitesh will serve the same battalion his late father served in the Army. Soon, after completing the passing-out parade, Hitesh paid tribute to his deceased father at the latter's memorial in the Civil Lines area of Muzaffarnagar. Not many men can dare to dream a life full of sacrifices knowing well enough the life-threatening dangers associated with the choice. Not many women are brave enough to support their children to choose a career that took away her husband from her -- all for the sake of the country. Well, few do. 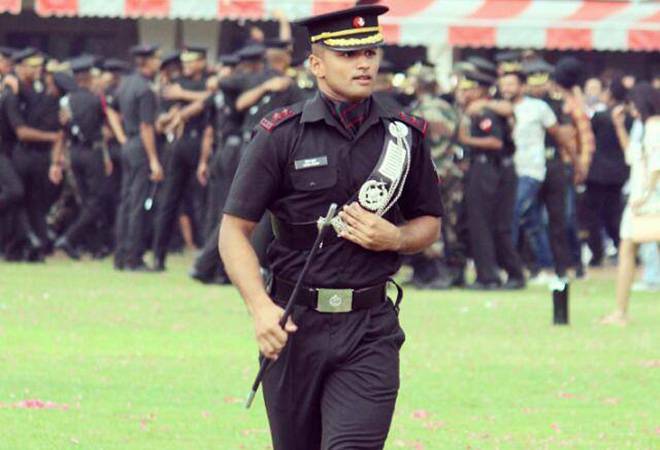 And one among them is proud mother Kamesh Bala, whose 25-year-old son has been commissioned as a lieutenant into the Indian Army after passing out from the prestigious India Military Academy in Dehradun. It is perhaps because of Kamesh Bala's love for the country and her son's determination to serve in the Indian Army that Hitesh chose a career in which his father, Bachan Singh, Lance Naik in the 2nd Battalion of Rajputana Rifles, was killed in the Kargil War on June 12, 1999. Though Hitesh was just six-year-old when his father martyred at Tololing in Kargil, he swore at that time he would one day join the Army and make his parents proud. It's a special moment for Kamesh Bala for another reason too. Her son would serve the same battalion as her deceased husband, a Times of India report said, adding that shortly after the passing out parade, Hitesh paid tribute to his deceased father at the latter's memorial in the Civil Lines area of Muzaffarnagar. The report quoted him saying it was not only his dream to join the Army but his mother's too, adding that he wanted to serve the country with utmost pride and honesty -- the way his father did. Hitesh's mother mother says her younger son, too, is preparing to join the Army. "It has been a difficult life since Bachan was martyred. I dedicated my life to raising my two sons. Today I am proud that Hitesh was commissioned into the Army. His younger brother, Hemant, is also preparing to join the Army. There is nothing more I could ask for," she told the newspaper. According to Rishipal Singh, who was in Bachan's battalion in the Kargil War, Bachan Singh, a fearless and brave soldier, was shot in the head. His battalion lost around 17 soldiers that fateful day amid the constant exchange of fire from both sides in Tololing, the report said, adding that his father would be proud of his son for being recruited in the same battalion with which he fought bravely and martyred for the country. According to the report, the brave lives lost in the battle for Tololing didn't go waste, as it was the 2nd Battalion of Rajputana Rifles that was able to win Tololing, the Indian Army's first victory in the Kargil War. In total, the Army lost over 100 jawans in the battle for Tololing, including 2nd Battalion of Rajputana Rifles' second-in-command, four officers and two joint commander officers.